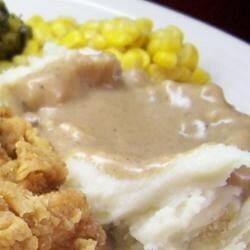 "Old-fashioned brown gravy. Made from meat drippings." I have never had problems making gravy in the past, but this just didn't work. It wouldn't thicken, and was very bland, even with A LOT of salt and pepper. Pretty good! Definitely needed seasoning, but easy and tasty. This is a good recipe, but it needed some salt and pepper. I used beef stock in place of water for a richer flavor.